I just finished reading Gathering Moss and it was a lovely surprise. Not what I was expecting. I was expecting lots of pieces of science detailed and separate. What I got was one whole. A story, woven together with moss. I love this book and I love moss! I see it everywhere. As I’m walking across a gravel pathway at work….there it is! As I lift my eyes to gaze at the trunk of a tree….it’s there too! As I look at at a distant stand of Maple and see a green fuzz, it’s too early for leaves….could it be moss? I betcha. It’s on my roof, under my feet and over my head! So prevalent that we don’t notice it any more. So it was with joy that I read Gathering Moss and began to really see it, this diminutive perfect plant. The author teaches with simple instruction as well as analogy. It was easy to discover the world of moss in these 162 pages. But now I want more! Suddenly I need their names, and it seems hard, as I’ve never identified individual mosses before. Ms. Kimmerer, can you come out to Seattle for a field identification seminar? She says: Learning to see mosses is more like listening than looking. A cursory glance will not do it. Straining to hear a faraway voice or catch a nuance in the quiet subtext of a conversation requires attentiveness, a filtering of all the noise, to catch the music. Mosses are not elevator music; they are the intertwined threads of a Beethoven quartet. You can look at mosses the way you can listen deeply to water running over rocks. The soothing sound of a stream has many voices, the soothing green of mosses likewise. The author has a beautiful way with words. She speaks of moss and rocks in the beginning. Within the circle of stones, I find myself unaccountably beyond thinking, beyond feeling. The rocks are full of intention, a deep presence attracting life…..The rocks are beyond slow, beyond strong, and yet yielding to a soft green breath as powerful as a glacier, the mosses wearing away their surfaces, grain by grain bringing them slowly back to sand. There is an ancient conversation going on between mosses and rocks, poetry to be sure. About light and shadow and the drift of continents. She reminds us that: Mosses are so little known by the general public that only a few have been given common names. Most are known solely by their scientific Latin names, a fact which discourages most people from attempting to identify them. I’m one of those people. Moss names have always been distant and out of reach. Not part of our vocabulary like salal or mahonia. Where have you been hiding dicranum, fissidens, tetraphis??? Let’s start at the beginning. Definition. A true moss or bryophyte is the most primitive of land plants. Mosses are often described by what they lack, in comparison to the more familiar higher plants. They lack flowers, fruits, and seeds and have no roots. They have no vascular system, no xylem and phloem to conduct water internally. they are the most simple of plants, and in their simplicity, elegant. I found it very interesting that mosses are much more susceptible to air pollution damage than are higher plants. Robin Kimmerer tells us the almost impossible, that most mosses are immune to death by drying. For them, desiccation is simply a temporary interruption in life. Mosses may lose up to 98 percent of their moisture, and still survive to restore themselves when water is replenished. It’s like a plant with a little bit of magic. And turns out to be very useful. Native Americans used mosses for diapers and sanitary napkins. Magic diapers! Remember that, moms, if you find yourselves out in the woods in a pinch. This book will also introduce you to the astounding world of the waterbear, or tardigrade. A tiny animal, .5 mm in length, that roams the water ways of the mosses, sucking out the contents of the moss cells. When the moss dries out, they do as well, going into a period of suspended animation. In this state they can withstand desiccation, freezing, boiling, radiation and things that most life on earth can not. They are unbelievable! I found this really cute/ nerdy/strange video on The Featured Creature. It will broaden your horizons. 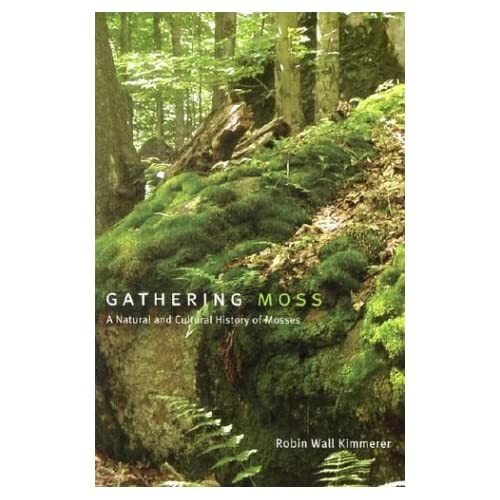 In one section the author discusses how two different mosses can inhabit the same log. Ecological theory predicts that coexistence is possible only when the two species diverge from one another in some essential way. This theory made me think of men and women. Maybe the only way that we can coexist is because of our differences, which there are many! But in the case of mosses, she is referring to their reproductive strategy. One moss only grows on top of logs she discovered, because this is a pathway for chipmunks who disturb the area and spread the tiny moss propagules along the way. There are always many parts to a puzzle and how curious that moss and chipmunks are linked together! I fully appreciate her answer to the homeowner who complains about moss in their lawn. They always want to kill it. Robin responds mosses cannot kill grasses. They simply haven’t the ability to outcompete them. Mosses appear in a lawn when conditions for moss growth are better than conditions for grass growth. Too much shade or water, too low a pH, soil compaction–any of these things can discourage grasses and let the mosses appear. Killing the mosses would not help the ailing grass in any way. Better to increase the sunlight, or better, pull out the remaining grass and let nature build you a first-rate moss garden. Hear hear!!! Ms. Kimmerer poses a thought provoking question at the end of the book. She reminds us of all the things that plants provide for us and asks: In the web of reciprocity, what is our special gift, our responsibility that we offer to the plants in return? I know what plants give to me, food, shelter, beauty, life, but I don’t often ponder what I can give to the plants in return. A clean earth? Less pollution? Reduce, reuse, recycle? I guess I can do all those good things not just for me, but for our planet and for the plants as well. Interesting how similar those two words are, plant and planet, one is the other. She answers her question with these passionate words; Our ancient teachers tell us that the role of human beings is respect and stewardship. Our responsibility is to care for the plants and all the land in a way that honors life. We are taught that using a plant shows respect for its nature, and we use it in a way that allows it to continue bringing its gifts….We can live in such a way that our thoughts of respect and gratitude are also made visible to the world. We have so much moss in our garden – on the ground, on trees, and on our roof too. So your article about this book is really interesting. I’d also read about those little creatures in a German book, but didn’t know the English name. I shall take a closer look now, at the book as well as the mosses! Thanks Elaine! It’s true that we don’t see the trees for the forest. we usually don’t notice the moss when we are gazing at all those beautiful flowers! A beautiful review with beautiful sentiments. I love the quietness of moss in my own garden — it doesn’t scream for attention, but it’s presence on rocks and wood always make me pause and smile. Yes, it adds that background goodness! Eloquent review Elaine. Moss gardening is getting some respect around here lately. I have only a tiny bit but hoping to increase it gradually. Elaine you and I are so alike when it comes to mosses. I have such an addiction…I adore them and look for them all over my garden welcoming them. I plan to check out the book as the author’s philosophy is so like mine…we are obliged to care for our plants and our land. Another reason I love natives as mosses are a perfect native plant. Yes, it’s a great book. I’m glad you love them too! Nice, Elaine, and I love the new look. My mosses are now almost completely grown together, there are only some small square inches of bare soil between them. It is interesting as they creep along and spread themselves: the ones I though most vigorous might not be, those slowest to established may yet become dominant. It would be interesting, over a very long period of time, to observe which will ultimately win or lose. Living as I do with thousands of square feet of moss, hundreds of ferns, next to a swamp, and overrun by my dreaded, love-to-hate-’em Mountain Beavers, sometimes it is like existing in some state of prehistory as all of those organisms are tens of thousands of years old, or much older still. So resilient to last so long unchanged, and so fragile also. I am going to get that book. Welcome to Bryophyte Club! Yea! I’m in the club. Go Bryophytes! We only meet when it’s raining and no flowers allowed!